"Sampath Speaking" - the thoughts of an Insurer from Thiruvallikkeni: Harmanpreet Kaur's heroic 171* - Mac Lanning out for a duck !! Harmanpreet Kaur's heroic 171* - Mac Lanning out for a duck !! In 1975, even before we realized and understood much about World Cup Cricket, there was this huge century ! ~ Glenn Turner made merry against an inexperienced East African attack to pile up 171 which was to be eclipsed later by mercurial Kapil Dev. New Zealand played East Africa at Edgbaston, a curious mix of players from the nations of Kenya, Uganda, Tanzania and Zambia. Among the many was Don Pringle, the father of England all-rounder Derek Pringle. He was 43; John Nagenda, born in the Belgian Class B Mandate territory of Ruanda-Urundi bowled the 1st ball – as Glenn Turner made merry. Turner was to make another ton (114) against India in 1975 WC. Nothing more on Men ~ this is time for ICC Women WC ~ there were tears of joy, sooner to turn bitter as we relish calling South Africa, chokers. Chloe Tryon and Marizanne Kapp, playing in their second and third World Cups respectively but first knockout match, could not hold back their emotions when the national anthem was played. They were overjoyed, they were expectant, as was a nation. Of course, there were tears at the end. When Anya Shrubsole threaded the third-last ball of the match through the gap at point to the boundary, the South African side slumped to the ground just as their men's team had done at Auckland in 2015. And they cried. SA out of the cup, and England through to finals. Today, in the other Semis, Indians play a strong Australia; past records suggest that Aussies are unbeatable. The match has been reduced to a 42-overs-a-side contest. That will effectively mean two bowlers can bowl nine overs, and three bowlers can bowl a maximum of eight overs. Lanning flung the coin up. "Heads” was the call and Mithali Raj got it right, chosing to bat. Lanning was to say : With the weather around, I wasn't sure. So, a good toss to lose. It is about attacking the 42 overs and we are ready to go. I come in for Rachael Haynes. Actual captain in and deputing Captain out of the Team. With the strong batting line-up that Australia boasts of – what will be a good score ? – India crawled – at half way mark – 21 overs they were 77/2; after 25 – 101/3 and after 30 – 132/3. How much 12 overs can be milked was the Q ? ~ and what would you have bargained ?? India have a "50-50" chance of beating defending champions Australia in the Women's World Cup semi-final, an opinion the former India captain Anjum Chopra insists isn't merely the "hope" of a positive outcome. Chopra has been closely following the fortunes of Mithali Raj's team as a commentator, but concedes Australia's superior experience and pedigree will be a factor going into the clash. Australia have won six of the 10 World Cup tournaments prior to this and hold an overwhelming 34-8 win-loss record against India in ODIs. Since the last World Cup in 2013, India have won just one of their four ODIs against Australia. In the group stages of this edition, Australia won six of their seven games while India won five. Aussies looks mighty and unconquerable ~ Smriti Mandhana failed with high expectations after her scores of 90 and 106* - have you followed H Kaur ?? - Harmanpreet Kaur Bhullar 28 played for Sydney Thunder in Big Bash. She is a big hitter, I have heard – had the fortune of seeing her classy innings matching Glenn Turner, batting like Kapil Dev or like her idol Virender Sehwag. Viru promptly greeted her with his tweets. Over no. 34 of Jonassen – 2, 1,1,6,4,1; over no. 37 of Gardner – 1,6,6,4,4, 2 (23) – India had galloped to 215/3. 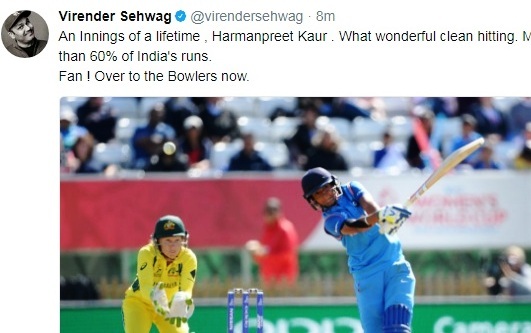 39th over Vilani hit for 19 ~ a blinder, a stunning innings – exceptional quality of hitting, Harmanpreet scored her second century of World Cups in just 90 balls and with some lusty blows to the boundary. She took charge of the innings and then scored at free will. Her century came with a help of 12 fours and two sixes. On her final run to complete the run, there was much drama. Batting on 98*, she pushed the ball for a couple of runs. Her partner Deepti Sharma was struggling in the running and responded late to the call of the second run. She had to dive to save herself and later Harmanpreet had to dive to save herself as well. 20th July 2017 @ 21.50 hrs. Pic : Harman Kaur in bigbash – cricinfo.au.